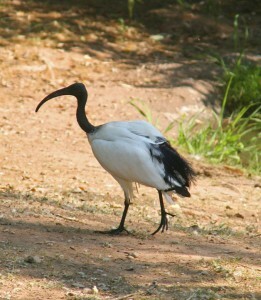 This mostly white bird gathers in flocks in Africa south of the Sahara to feed during the day and to roost at night. They have been found in breeding colonies of as many as 200 birds. They are social birds and often mingle with other species of bird. Conservation Status: No special status. The ancient Egyptians worshiped these birds. Over a million mummified scared ibis remains were located in one group of tombs in Egypt.